The title may seem like an old movie Drew Barrymore had starred at but this post has nothing to do with her, unless she's on Glee. No? Well, nevermind. 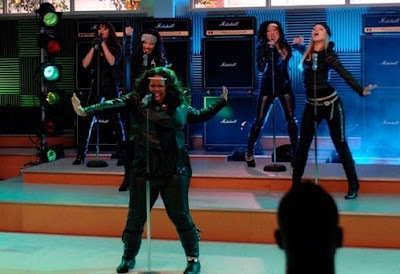 Since we have to wait for next week for a new episode of Glee (The Rocky Horror Glee Show), two weeks after that comes "Never Been Kissed". Although I don't think the title really has anything to do with the movie because the episode is about controlling urges. Whatever that means, we just have to wait until November 9. Want more spoilers? Maybe later, let me post photos from Episode 7. Puck is back from juvy! See leftmost part of the picture. Sam and Quinn, would their relationship blossom? 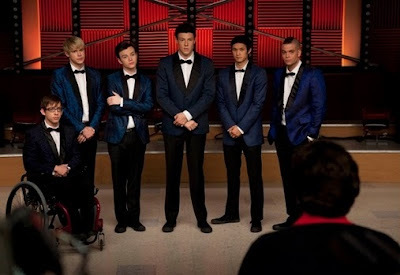 The boys... in bowties and dapper suits!?! They clean up nicely, don't you think? Looks like Rachel went back to her first love, animal-printed sweaters! The girls wear leather for what seems to be a rock number, another Paramore song perhaps? Now on to more spoliers! 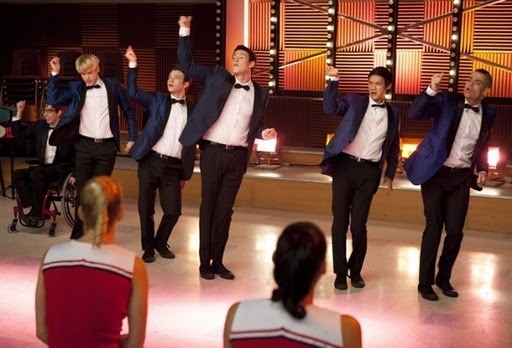 On November 16, Gwyneth Paltrow arrives to fill in for Mr. Schuester while Sue Sylvester takes over Principal Figgins! Yikes! Be afraid! Be very afraid!!! And on November 23, Sue's mother will arrive just as New Directions prepare for Sectionals. Who is Sue's mother? Carol Burnet!